Hard to believe we've once again landed at the doorstep of the holiday season. Times flies, they say. As usual, the return of the season means the Holiday Ale Festival will be on tap next week in/at/on Pioneer Courthouse Square. This is one the best beer events of the year around these parts. No kidding. Officially, this is the 18th rendition of the HAF. It was founded in 1995 and ran a couple of years under the Winter Ale Festival banner. If you're wondering, the tents weren't clear in those days. 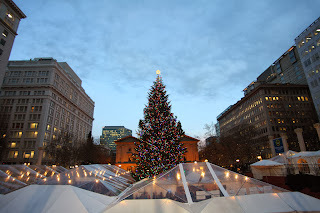 You could not look up and see the Portland skyline or the gleaming holiday tree. Nope. What you could see was fabric. I remember feeling somewhat claustrophobic. But never mind. After a couple of years, the festival took 1997 off. 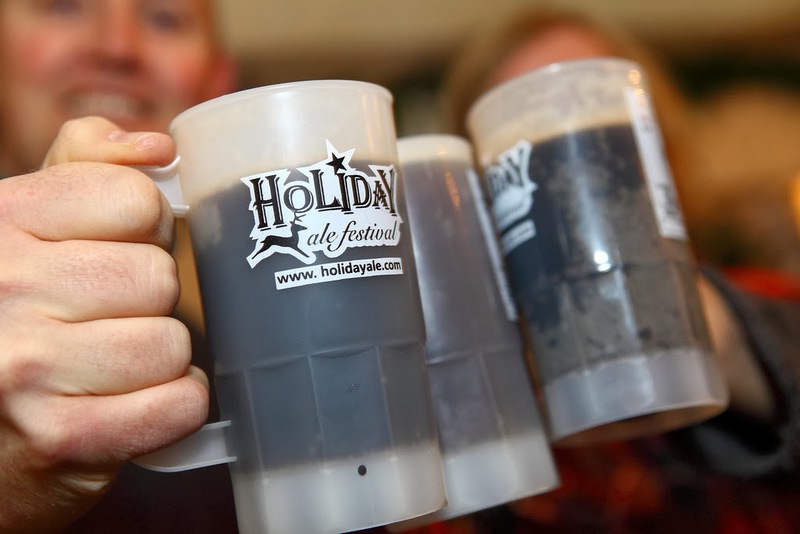 Ownership of the event subsequently changed and it was rebranded as the Holiday Ale Festival when it returned in 1998. If you're keeping track at home, one of the original founders still owns the Winter Ale Festival name, just in case he decides to bring it back someday. But these are merely details. The 2013 HAF will launch Wednesday, Dec. 4 and continue through Sunday, Dec. 8. Wednesday kickoff is noon. The start time moves to 11 a.m. for the rest of the festival. Closing times are 10 p.m. Wednesday through Saturday, 5 p.m. Sunday. Are you ready? As most everyone knows, the best times to be under the tents tasting beers are Wednesday, Thursday and Sunday, preferably in the afternoon. You might be okay crowd-wise early Friday...it will get quite crazy by late afternoon. I haven't attended on Saturday in several years, but it was a mosh pit by mid-afternoon the last time I sampled Saturday. I suggest avoiding Saturday unless it's the only possible day you can attend. For folks who are lucky (or unlikely) enough to work downtown, the early start times offer the opportunity to go sample a few choice beers during your lunch hour. That's either a great idea or a really bad one, depending on how your office feels about you returning to work on your lips. In past years, I've seen lunch hours extending into the evening...a terrific idea if you can get away with it. They expect to have 47 beers on tap for this year's festival. The great bulk of these beers clock in at over 8% ABV (nearly a third are over 9%! ), which explains why you probably don't want to spend a lunch hour sampling. Thankfully, public transit is close at hand and organizers also do their best to accommodate designated drivers. No one should drive after drinking at the HAF. I should mention there are beers beyond the 47 standards. As part of their specialty program, the HAF will have additional tappings of super special beers at specified times during the festival. These are limited release beers where they only have a keg or so available. I can't provide specifics on these beers because the list is not yet finalized. The web link is here once they have it dialed. One of the things I truly love about the Holiday Ale Festival is that it attracts people from all over. In this case, "all over" means exactly that: I've met people from the east coast, from California, from Canada and Australia at this event. Don't be shy about striking up a conversation with the people around you at the HAF. You may be surprised to find out from whence they came. There are more details. For example, you can buy advance tickets on the event website. It's a slightly better deal if you buy online, but you'll still be picking up your mug and tickets at the entry desk. Another important detail: this is a 21-and-over event. Space is limited here compared to some of our other festivals, so please leave the kiddies at home. Oh yes, the pinup art for 2013 is Angel (see above). There's a list of event facts here. I expect to attend the festival on Wednesday, when I know all the beers will be on and it won't be particularly busy. I'll follow up my visit with a short list of beer picks here, probably on Thursday. See ya down there. Or not. Update: Event organizers now say the venue will open at 11 a.m. all days.